We are eternal. We are unyielding. During the Battle for Light's Hope Chapel, where ten thousand Scourge faced off against three hundred defenders of the Light, the corrupted Ashbringer wielded by the death knight commander, Highlord Darion Mograine, refuses to obey its wielder. When Fordring arrives, his powers of the Light prove too great for even ten thousand to oppose, and Mograine orders his death knights to surrender. Fordring scolds Mograine for his foolishness and tells him that Arthas sent him and his death knights on a suicide mission. As they await the paladin's judgment, they witness a vision of Mograine's father, Alexandros, the legendary Ashbringer himself. He told his son that he would one day wield the Ashbringer and use it to mete out justice, but "that day is not today". The Lich King himself arrives not long afterwards and confirms that he had indeed sent the death knights to their deaths in order to bring Fordring out of hiding. Enraged by this treachery, Mograine attacks, but the Lich King swats him aside in one hit and focuses his attention on Fordring, incapacitating him with a crippling spell and knocking back the Argent soldiers who charged in. Remembering the words spoken by his father, Mograine throws the corrupted Ashbringer to Fordring, whose powers of the Light succeed in purifying it. With the purified blade in hand, Fordring charges into the Lich King and throws him back. Leaving their battle for another day, the lord of the Scourge flees back to Northrend, warning Tirion that: "When next we meet, it won't be on holy ground, paladin." After Arthas' departure, Fordring calls for the union of the Argent Dawn and the Order of the Silver Hand into the Argent Crusade, intended to bring the war to Icecrown itself. Mograine pledges himself and his knights to the same cause, naming his new order the Knights of the Ebon Blade. With their free will restored, Mograine and his death knights return to Acherus and capture it, destroying the Scourge remnants within. With their new base secured, Mograine then sends his knights to rejoin their people, sending them to throw themselves at the mercy of either King Varian Wrynn in Stormwind (if their race belonged to the Alliance) or Warchief Vol'jin (originally Warchief Thrall and later Warchief Garrosh Hellscream) in Orgrimmar (if they belonged to the Horde). The surviving death knights that remained loyal to the Scourge formed the Host of Suffering with Orbaz Bloodbane, who fled when the Scourge was defeated at Light's Hope, as their leader. Although the members of the Argent Crusade still stand by the Forsaken heroes who joined them in the battle against the Scourge, Sylvanas Windrunner's actions since the slaying of Arthas had deeply concerned the crusaders. They, along with certain members of the Ebon Blade, decided to watch Sylvanas and the Forsaken very closely, as similarities between her and the Lich King kept increasing in number by the day. The death knights of the Ebon Blade offered their aid to the commander of the Alliance or Horde's forces and joined their garrison. Having an exalted status with the Ebon Blade even offered the commander the possibility to have death knights defend their base. Taking the chance to discover the secrets of Ner'zhul, Darion Mograine had traveled to alternate Draenor and could be found in the Lunarfall Inn (Alliance) and the Frostwall Tavern (Horde). Though the Lich King had been defeated, Darion claimed that they were no closer to unlocking the secrets of the Frozen Throne than they were when jousting pointlessly at the Argent Tournament. Bolvar remained resigned to his fate. Darion believed that perhaps there was something there that could aid their cause. Ner'zhul was not always the Lich King, he explained. Once, he was a mere orc dabbling in dark powers beyond his comprehension. He asked the commanders of the Alliance and Horde's forces to find whatever they could of Ner'zhul's early studies, and they returned with a Dark Parchment from the Shadowmoon Burial Grounds, which Darion brought back to the Ebon Hold. A death knight adventurer also appeared in Spires of Arak. Following the return of the Burning Legion, the Knights of the Ebon Blade come to an agreement with the new Lich King, Bolvar Fordragon: The Ebon Blade will willingly act as the Lich King's agents against the Legion, if the Scourge remains contained to Northrend. The Lich King offers powerful weapons to champions of the Ebon Blade, directing students of Lord Thorval to the world of Niskara to defeat Gorelix the Fleshripper and take the Maw of the Damned, and sending the students of Lady Alistra to the catacombs beneath Karazhan to obtain Apocalypse from the Dark Riders. For those trained by Amal'thazad, the Lich King summons them directly to Icecrown Citadel, where they gather the broken shards of Frostmourne to forge into a pair of new weapons, the Blades of the Fallen Prince. Once these three weapons are obtained, the death knights wielding them are brought to the Frozen Throne and granted the Lich King's blessing, empowered to act in his name against the Legion. The Knights of the Ebon Blade also set out to reform the Four Horsemen, adding new powerful champions into their ranks. Thassarian also asked death knight champions to aid him in rescuing Koltira Deathweaver from his imprisonment in the Undercity. Koltira is successfully rescued after the two death knights fight through the guards. All players, with the exception of death knights, start out at neutral with the Knights of the Ebon Blade. Upon the completion of The Light of Dawn (quest), death knights are raised to friendly reputation. Additionally, as with some other factions, reputation can be gained through Championing via the [Tabard of the Ebon Blade], or by trading 1 Emblem of Triumph for 1 Ebon Blade Commendation Badge at the Emblem of Triumph Quartermaster in Dalaran. These rewards can only be purchased after completing the It's All Fun and Games (Alliance) | It's All Fun and Games (Horde) questline in Icecrown. The questline is available starting at level 77 from Thassarian on the The Skybreaker, Koltira Deathweaver on the Orgrim's Hammer, or from Baron Sliver at the Shadow Vault. Rewards are bought from Duchess Mynx [43, 20]300px at the Shadow Vault. 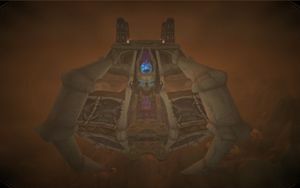 ↑ 魔兽集换式卡牌游戏: Assault on Icecrown Citadel 1.